We’re counting down the 10 Useful Things You Didn’t Know You Could Do With Your iRecruit Account. 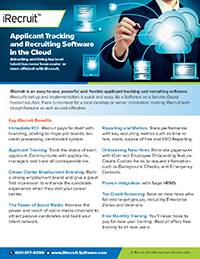 iConnect allows you to take control of the mountain of new hire paperwork and manage it online in your secure iRecruit database. iConnect includes I-9s, W-4s, and State Tax Forms. iConnect also has the ability to build and create almost any onboarding document. CMS Says: We do have a secure online portal for all new hires to do the Work Opportunity Tax Credit screening questionnaire. Employers can also track and report on activity on the WOTC portal to make sure all employees are complying with the 28-day Rule. CMS also allows employers to screen via paper and phone. They say it’s never a good idea to get back together with an ex. But try telling that Prince William and Kate Middleton, Justin Timberlake and Jessica Biel, or Dax Shepard and Kristen Bell. These couples prove that breakups don’t have to last forever and can even make for a stronger relationship the second time around.